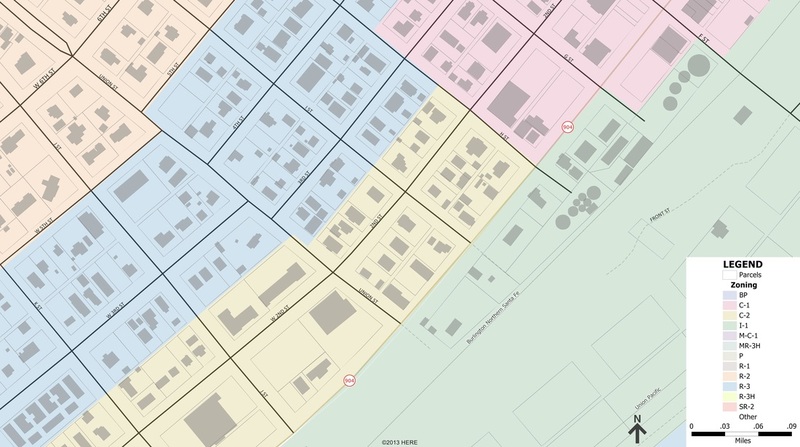 Cardinal Geographics has helped small towns produce city-wide zoning maps for use by city officials and residents. To create a basemap, Cardinal Geographics collected Spokane County parcel data as an ArcGIS Shapefile. This parcel shapefile served as the underlying fabric of the zoning map. In addition to the parcels, street information and other labels were added as necessary for visual reference. To create the zoning layer, existing zoning maps were used as a reference and attributes were then added to define zoning classifications for each shape. The attribute definitions enabled the map to be color coded for easy zoning area identification. Here is an example from a town in eastern Washington.